Sarah's doing just fine... Sure, she's been single for the last two years, and has to spend an uncomfortable amount of time around her ex-boyfriend, his perfect new girlfriend and all their mutual friends. And yes, her job as a PA to one of the most disgusting men in London is mind-numbingly tedious and her career is a constant disappointment to her mother. But it's really okay. She's happy(ish). So it's not surprising that when Sarah starts dreaming about a handsome stranger, she begins to look forward to falling asleep every night. Reality isn't nearly as exciting. I've got to stop writing down the blurb right there, if you haven't got the book yet, try to not read the blurb to the end. I regretted it, because it takes a bit of the surprise out of the book. I hate spoilers in the summary... But I didn't hate the book at all. 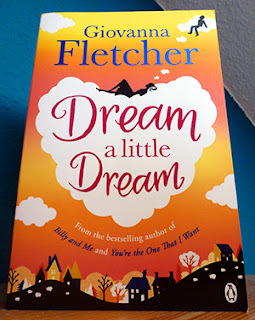 This is the second book by Giovanna Fletcher I have been reading, after Billy and Me earlier this year. Her style of writing is smooth and entertaining, it's a bit like your reading a very long letter from a friend, telling a story to you. Accordingly her books are a good way to relax and drift away to another reality. But to a reality that feels like it could be true, just another weird but wonderful life of someone else. I've got the feeling she writes just the books I would write myself, I love her ideas. Whilst reading this book I felt like I became a friend of Sarah, the main character. She's just an ordinary woman, who has a bit of a weird mind. In a good way. I think I might be exactly the same. So that book and the characters in it made me dream, dream of what could possibly happen to me one day. Sarah: "A gentle reminder that life makes us all view beauty in very different ways. Unless it's George Clooney, Brad Pitt, Billy Buskin, Ryan Gosling, Leonardo DiCaprio,..."
Julia: "Wait, Ryan Gosling? Nope, Ryan Gosling isn't an exception - I don't think he's hot." There I said it, you can hate me now. Sarah: "I, at twenty-nine years old, have an imaginary boyfriend - a boyfriend who I've shared a plathora of adventures with, but only in the creative mind space of my dreams." Julia: "Don't worry Sarah! Which single woman doesn't have an imaginiary boyfriend? Or wait. Am I the only real one? Please tell me I'm not..."
Yeah, well. There you go . A little insight into my crazy mind. Anyway. Back to the book. It's a cute story, it is fun to read and some parts really tough the heart in different ways. Will you read it? Or have you already read it? What did you think of it? Let me know in the comments below.